Kurt Warner's story is one of the greatest in NFL history. It is also a contributing factor to the collectibility of his football cards and autographed memorabilia. He is the only player in the NFL to go from stocking shelves at a local grocery store as a grown man to Super Bowl MVP. America loves an underdog story and Warner's is certainly one of the best. After being undrafted in 1994, Warner would sign with the Iowa Barnstormers of the Arena Football League. He has three team-issued cards from his time with the club. 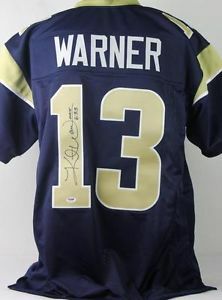 In 1998, Warner finally got his shot at the NFL and was signed by the St. Louis Rams. During his 12-year career, Warner played for two other teams as well, the New York Giants and the Arizona Cardinals. 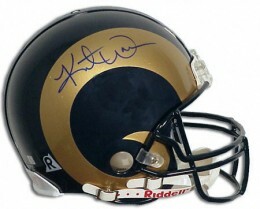 He would win the NFL MVP award two times and lead the Rams to a Super Bowl Championship. 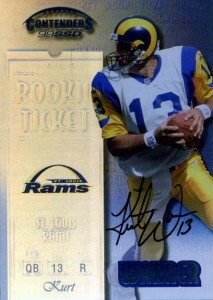 Kurt Warner has a total of 14 rookie cards. They can be found in multiple products from the 1999 season. Warner has multiple certified autograph cards that were issued in 1999 as well. 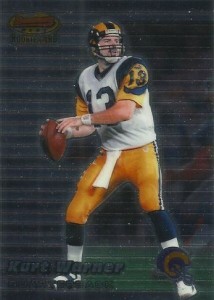 One of them, 1999 Playoff Contenders card, is also a rookie card. In addition, Warner also had three memorabilia cards released in 1999. 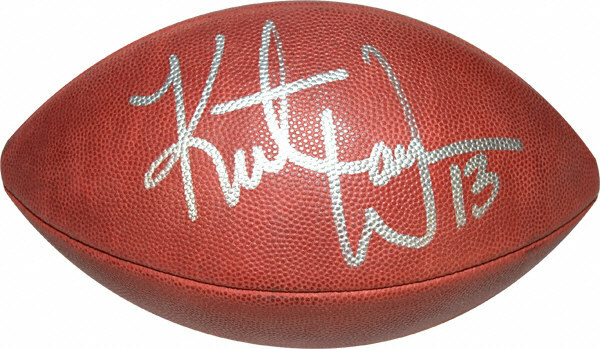 Kurt Warner's autographed memorabilia is collected by a lot of people. He signs personal items through his website for a donation to his charity. He also participates in the occasional organized signing event. Items pertaining to Super Bowl XXXIV carry a premium. 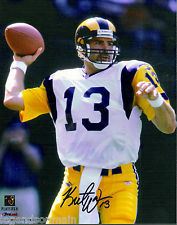 Kurt Warner has several autograph cards from 1999 but Playoff Contenders is the only one that's a rookie card. The card also has three parallels: Gold (#/25), Blue (#/50) and Red (#/100). 1999 Pacific KURT WARNER TONY HORNE RC BCCG 10 Rookie Super Bowl MVP HOF Rams !! Below you will find examples of what an authentic Kurt Warner autograph looks like. This can be used as a first point of reference for determining the legitimacy of autograph memorabilia, but is not a substitute for having your items authenticated by a well-respected professional autograph authentication company. Some of the trusted sources within the sports memorabilia market include the following companies: PSA, JSA, Steiner, Tristar and Mounted Memories. Click on any of the images below to view full size photos. The letter "K" starts with a curl on the top of the left vertical line. The cross lines form a loop that extends to the left of the letter. The letters "r-u" are implied. The letter "t" looks like a lower-case cursive "l" that is crossed in the center. The "W" is widely space with rounded humps. The letters "a-r" start in the center of the right most hump. An extending line to the right implies the remaining letters.